Below is an interview with the Catholic historian, author, and speaker Professor Roberto de Mattei on the nature of the escalating crisis in the Church. Maike Hickson (MH): Many Catholics around the world had hoped that the Dubia Cardinals would publish their public correction of Pope Francis concerning his Post-Synodal Exhortation, Amoris Laetitia. What would you tell those among the faithful who are now disappointed and even discouraged in the face of the silence of the princes of the Church? With which words would you try to encourage these faithful to persevere in their hope and in their Faith? 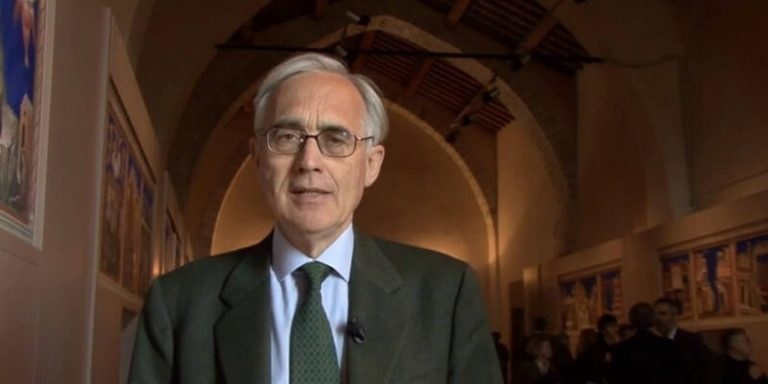 Roberto de Mattei (RDM): The present crisis in the Church did not originate with Pope Francis, and it is not focused in one single person; rather, it dates back to the Second Vatican Council, and, going back even further, to the Modernist Crisis [of the early twentieth century]. Today a large part of the college of cardinals, of the college of bishops, and of the clergy in general, are infected with modernism.3 The few cardinals, bishops and priests who resist ought to take account of this situation, and it is our job to help them. But above all one must not imagine that a single act by one of these players, for example a correctio fraterna of the Pope announced by Cardinal Burke, can, by itself, resolve the crisis. What is needed is a convergence and focus of action by diverse groups of both clergy and laity, each one at their own level and according to their own capability. The sensus fidei can guide the cardinals, bishops, religious, and simple laity how to react [to the present crisis]. The importance of the correctio filialis, signed by 250 scholars, both religious and lay, was that it expressed this sensus fidei. The reaction may be different from one country to another, from one diocese to another, but its characteristics are always those of a profession of the truth and a denunciation of the errors which are opposed to this truth. MH: But how can this situation be resolved? RDM: It will not be men who save the Church. The situation will be resolved by an extraordinary intervention of Grace, which however must be accompanied by the militant commitment of faithful Catholics. In the face of this present crisis there are some who think that the only thing to do is to wait for a miracle in silence and prayer. But it is not like this. It is true that we need a divine intervention, but grace builds on nature. Each of us ought to do the maximum that we can according to our ability. MH: The 2016 letter with which Pope Francis gave his approval to the guidelines laid out by the pastors of Buenos Aires was published in Acta Apostolicae Sedis, with a note written by the Secretary of State, Cardinal Parolin, according to which the Pope himself wanted the two documents – the guidelines and the letter – published in AAS. RDM: The fact that the guidelines of the Argentine bishops and the approval of the Pope have been published in AAS has made it official that “no other interpretations are possible” of Amoris Laetitia other than that of the Argentine bishops, which authorizes communion to be given to those divorced and remarried people who are in an objective state of mortal sin. The letter was private, but the publication in AAS transforms the position of Pope Francis into an act of the Magisterium. It seems to me that this confirms the thesis expressed by Fr. Giovanni Scalese in his blog, according to which we are entering into a new phase of the pontificate of Pope Francis: moving from a pastoral revolution to the open reformulation of doctrine.3Pope Francis’ discourse of October 11 , on the occasion of the 25th anniversary of the promulgation of the new catechism, seems to call for the beginning of a reinterpretation of the Catechism of the Catholic Church in the light of Evangelii Gaudium and Amoris Laetitia. MH: In a recent essay, in light of how Luther is now being reinstated within the Catholic Church, you stated: “In short, every Catholic is called upon to choose whether to side with Pope Francis and the Jesuits of today, or be alongside the Jesuits of yesterday and the Popes of all time. It is time for choices and to meditate precisely on St. Ignatius’ two standards (Spiritual Exercises, n. 137)* which will help us make them in these difficult times.” Would you explain these words a little more to our readers, not only in light of the question of Luther, but also in light of Amoris Laetitia? RDM: There are moments in our life and in the history of the Church in which one is obligated to choose between two sides, without ambiguity and compromise. The Spiritual Exercises of Saint Ignatius and theology of history of Saint Augustine in The City of God do nothing other than emphasize the Gospel maxim according to which “no one can serve two masters; either he will hate the one and love the other or love the one and hate the other” (Matthew 6:24). Seen in this light, the recent publication in AAS of the letter of Pope Francis to the bishops of Buenos Aires reduces the matter to two diametrically opposed positions. The line of thinking of those cardinals, bishops, and theologians who maintain that it is possible to interpretAmoris Laetitia in continuity with Familiaris Consortio 84 and other documents of the Magisterium has been reduced to dust.3 Amoris Laetitia is a document which serves as a litmus test: it must be either accepted or rejected in toto. There is not a third position, and the insertion of Pope Francis’ letter to the Argentine bishops [into AAS] has the merit of making this clear. MH: There are those who deny that the publication of the letter to the Argentine bishops is an act of the Magisterium, because it proposes an erroneous, if not heretical, position. RDM: Whoever thinks this, it seems to me, begins with a false premise: the idea that the pontifical Magisterium can never err. In reality the guarantee of inerrancy is reserved to the Magisterium only in specific conditions, which are clearly spelled out in the Dogmatic Constitution Pastor Aeternus of Vatican I. The existence of errors in the non-infallible documents of the Magisterium, including the pontifical Magisterium, is possible, above all during periods of great crisis. There can be an act of the Magisterium which is both authentic and solemn, but erroneous. This was the case, for example, in my opinion, with the declaration Dignitatis Humanae of Vatican II, which, apart from its pastoral character, is undeniably a Magisterial act and almost certainly contradicts the doctrine of the Church on religious liberty, in at least an indirect and implicit way. MH: Do you see a formal schism coming, and what would it practically look like? Who would be the creator of that schism, and what would it mean for simple lay people? MH: You seem to suggest that the Pope may be promoting schism and heresy in the Church. What would be the consequences of this most grave situation? Would not the Pope lose his authority as Pope? RDM: One cannot sum up such an important and complex problem in a few words. On this point it is necessary to have a theological debate, on which topic one may refer to the volume True or False Pope by Robert J. Sisco and John Salza, to the writings of Abbott Jean-Michel Gleize in [the French journal] Courrier de Rome and above all to the study of Arnaldo Xavier da Silveira, Ipotesi teologica di un Papa eretico [Theological hypotheses about a heretic Pope], the Italian edition of which I edited in 2016 and also the next edition in English. The author, whose basic position I share, develops the thesis of the medieval decretists, of St. Robert Bellarmine, and of modern theologians like Pietro Ballerini, according to whom, while there is a basic incompatibility between [holding] heresy and [holding] papal authority, the Pope does not lose his office until his heresy becomes apparent to the entire Church. MH: And finally, what would your outlook and encouragement be for our readers, at the end of the 100th Anniversary year of the apparitions of Our Lady of Fatima? RDM: Discouragement is a sentiment which the militant Catholic cannot permit himself. The first weapon to employ against enemies who attack the Church is the use of reason, in order to demonstrate the contradictions in which these enemies live, and by which they necessarily die. Then we need to turn to the invincible help of Grace. One hundred years ago Our Lady of Fatima foresaw the crisis of our time. She announced a chastisement for humanity if it was not converted, but she also made an unconditional and irreversible promise: the triumph of her Immaculate Heart. For his part, Our Lord has promised us to be with us always, until the end of the world (Matthew 28:20). What more can we ask for?